There are countless skateboard games available for iOS and Android devices however True Skate is one of the simplest and most beautiful skateboard games ever designed. Unlike what you might think, it is nothing like Tony Hawk’s Pro Skater from EA Sports which is mission based. True Skate is available for iOS and Android devices and you can download it for $2 from Google Play Store and iTunes. The app is compatible with phones as well as tablets. 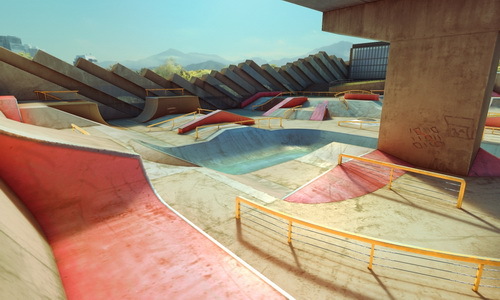 The game allows users to do a variety of things with their skateboard in a skate park and it offers freedom to do whatever you like. There are some missions you can complete to progress in the game. To some people, True Skate is a simulation game rather than a sport because of its excellent physics and graphics. The best thing about True Skate is its gameplay. In most of the other skateboard games, they show the skater too that just blocks out the view. However, in True Skate there is no skater but instead your fingers act like a skater. You can use two fingers, mimicking the feet of a skater and make amazing moves which are surprisingly accurate. True Skate is quite similar to Touchgrind in terms of gameplay to an extent. For example, in both games the player sees the skateboard and the objects on the way. Based on the terrain, players can make moves like flick, swipes and slides. The physics of both games is similar too, which works exactly like a real skateboard. True Skate is easy to learn and you would be able to understand things after few minutes, even if you are not familiar with real skateboards. However, the game gets more and more difficult after each mission and your skateboarding skills would be tested. Infinite Skater is another amazing skateboard game available for phones and tablets; you can download it from Google Play Store. Unlike True Skater, Touchgrind and Tony Hawk’s Pro Skater, Infinite Skater is a runner game where the players can make moves on the run. The iTunes version of the game is optimized for all latest devices as well and you can install it on iPhone 7, iPad 3, iPod 6th Gen and later devices. Considering the heavy graphics and sound effects of the game, Infinite Skater works best on latest devices and you might experience a little lag on older iOS or Android devices.